Clear skies this evening will become overcast overnight. Low near 55F. Winds SSE at 10 to 15 mph..
Clear skies this evening will become overcast overnight. Low near 55F. Winds SSE at 10 to 15 mph. What happened at SIUC's Old Main? 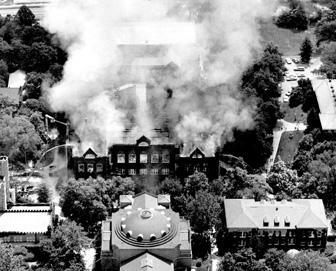 It's been more than 39 years since Old Main was destroyed by the work of an arsonist on the campus of Southern Illinois University Carbondale. Firefighters immediately knew they were dealing with a set fire, but in the nearly four decades that have passed since flames gutted the building, the case remains unsolved. At the time it burned, Old Main was the historic centerpiece of SIUC's campus. On a practical level it was home to offices for the English and history departments, foreign languages teaching labs, classrooms and the university museum. On another level, it was the heir to the university's first building, the surviving link from the little teachers college to what would become a large university. What is now SIUC opened in 1874 as a single-building teachers college called Southern Illinois Normal University. The original university building was gutted by fire in 1882. In 1886, the brick building that would become known as Old Main was built on the same spot. Its features included distinct arched windows, steeply-pitched dormers and a crowning clock tower. According to then-SIU President Delyte Morris, the building was, as much as any structure, the symbol of the university. Sitting in his wood-paneled den in his home just south of Carbondale, former firefighter Charles McCaughan said he remembers arriving at the scene shortly after 8 a.m. on Sunday, June 8, 1969. "When we rolled up it was just me and one other (firefighter) and the fire was on the top floor," he said. "You could see from there; it was a hell of a fire. The ladder truck only went up 85 feet; we could not get it (the water) in the window." With flames pouring from windows on the building's east side and no way to effectively douse them from the outside, McCaughan said he and SIUC police chief Larry Cagle went inside in search of a route for hoses. Shortly after they entered the building, McCaughan, who is now 82, said he and Cagle found proof positive the fire was no accident. Upon entering on the first floor, McCaughan said he and Cagle quickly extinguished a smoldering spot where it appeared an accelerant was burning out. Near the stairwell on the second floor, a pile of mops and rags had been doused and lit on fire. On the third floor it appeared accelerant alone had been used. The fourth floor, or attic, which housed an ROTC rifle range, was engulfed in flames. "It smelled like kerosene and diesel," McCaughan said. "It looked like whoever did it planned to set the fourth floor, and burn each stairway so you couldn't get up through the building to get to the fire and put it out." McCaughan added: "In the first five minutes there were two trucks there and four firefighters, not enough to move the hoses and equipment. And we didn't have breathing apparatuses like they do today. We were totally overwhelmed. We were not prepared for anything like that." News reports from that day said the building's tower and much of the east wall collapsed about 9:30 a.m. that morning. Fellow firefighter John Manis was 27 years old the day of the fire and among the first on the scene as Old Main burned. Manis said it wasn't long before help arrived but, by then, it was too late. "Units from Mount Vernon, Murphysboro, Marion, Christopher, DuQuoin, Elkville were all there early on," he said. "By late afternoon the fire was under control, but the building was destroyed. About the only good thing you can say about it is that no one was hurt." Before the building was gutted SIUC students took it upon themselves to help save what they could. Hundreds of them, said Manis, helped carry desks, books and papers out of the building before they were destroyed by smoke and flames. They also helped firefighters directly, moving hoses and lugging equipment where it was needed. "They raise a lot of hell, but when you need them in an emergency like this, they are here," Cagle said at the time. SIUC Director of Student Safety Todd Sigler said the Old Main case is still under investigation. "It's an open investigation and will remain that way, as far as I am concerned, until something develops ï¿½ that would lead to its being closed," he said. Carbondale resident Dan Seiters said he was a graduate student teaching English the day of the fire. While he said the building didn't make for the perfect teaching space, it was a special spot. "It was, of course, an absolutely senseless thing," he said of the fire. "It was a very interesting old building and an interesting piece of architecture. Like everyone else, I was in absolute shock at what happened."